Congress appeared headed for a shutdown Friday evening as lawmakers and the White House failed to reach an agreement with just hours until many federal agencies were set to close their doors. A breakthrough appeared possible Friday afternoon, as Senate leadership from both parties said they had reached an agreement. That agreement, however, was only to continue negotiations and to not hold any more votes until they had brokered a path forward with the president and the House. The Senate unanimously passed a “clean” CR earlier this week, but the House declined to vote on it after Trump said he did not support the bill because it did not provide $5 billion for his proposed wall along the U.S.-Mexico border. Among the federal entities at risk of shutting down some or all of their operations are the departments of Transportation, Housing and Urban Development, State, Interior, Agriculture, Treasury, Commerce, Homeland Security and Justice, as well as other independent agencies. A shutdown would see about 345,000 federal employees furloughed. Impacted agencies began shutdown preparations on Friday, giving employees informal notices of who would be exempted and who would be furloughed and specifying which operations would cease. Most employees will not receive formal furlough notices until Wednesday, their next regularly scheduled work day. The House passed a CR and wall funding measure, which also included $7.8 billion for disaster relief, on Thursday night. The Senate moved to advance that measure on Friday, but during a procedural vote it quickly became clear it would not have sufficient support. Many senators had left Washington, D.C., on Thursday thinking they were done working for the year, and were scrambling throughout the day to get back to the capital. Sen. David Perdue, R-Ga., said Friday evening that Congress and the White House had spent much of the day not even talking to each other. "We got involved to help get people talking again," said Perdue, who had recently talked to Trump. "I feel good we now have that momentum of the conversation going again." He expressed confidence Trump would agree to whatever deal lawmakers come up with, but when asked if a deal could only emerge after a shutdown commences, Perdue said only, "I hope not." The House adjourned late Friday afternoon, with leadership saying they would wait for a deal to come out of the Senate before voting again. 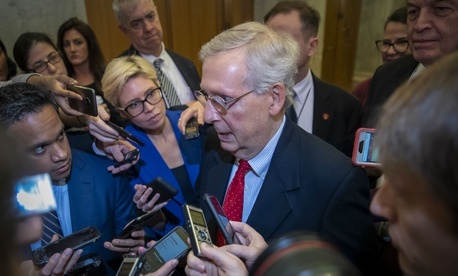 Senate Majority Leader Mitch McConnell, R-Ky., went to the White House on Friday but returned to the Capitol without a deal in hand. Trump later deployed Vice President Mike Pence, acting Chief of Staff Mick Mulvaney and Senior Advisor Jared Kushner to the Hill to meet with Senate Minority Leader Chuck Schumer, D-N.Y., and House leadership, but still no deal emerged. Both Schumer and McConnell took to the Senate floor to say they were continuing negotiations. Sen. Richard Shelby, R-Ala., the Appropriations Committee Chairman, said the burden was on Democrats to pass the CR-and-wall bill, suggesting there was no other path forward. Several Republican senators, including Shelby, suggested $1.6 billion toward border security might make for a good compromise, but they conceded they were not sure if Trump would support that number. Democratic and Republican senators had agreed to that figure for border security in their bipartisan Homeland Security Department appropriations bill. “Short of some big intervention or breakthrough, we’re headed to a shutdown,” Shelby said. Sens. Richard Durbin, D-Ill., and Bob Corker, R-Tenn., both said conservative media personalities such as Sean Hannity and Rush Limbaugh were actually calling the shots.